White sandy beaches, a relaxed vibe, sunny days, and clear cool water are a few things that await you in Sarasota, FL. With a metropolitan city like Tampa Bay to the north, this little city situated on the Gulf of Mexico is the perfect destination for adventurers looking to get out of the big city limits for a weekend or to take an entire vacation. Sarasota has an endless array of beach and water activities for anyone looking to spend a day in the sun, on or off the water. One of the most notable and increasingly more popular sports is stand-up paddleboarding (SUP) on the gulf or through the networks of mangrove canals. We suggest hiring a guide if it’s your first time trying SUP in Sarasota, and especially if it’s your first time ever. A guide can take you to some more secluded spots that are picturesque and give you some history lessons while teaching you the basics on stand-up paddling. If you prefer to go-it-alone BIC SUP’s How to SUP page provides some great tips and tricks to help you get started or to refine your technique. The staffs in you local retail shops are also a boon of information when it comes to SUP—see our list of recommended SUP retailers in your area. To get you started, here are some ideas of where to paddle, get some local knowledge of the area, and rent a board. One of the most popular, if not the most popular, spots for SUP in Sarasota is Bird Key Park. The park is situated on the northwest side of the Ringling Bridge and the parking lot is just a couple yards away from the water’s edge. 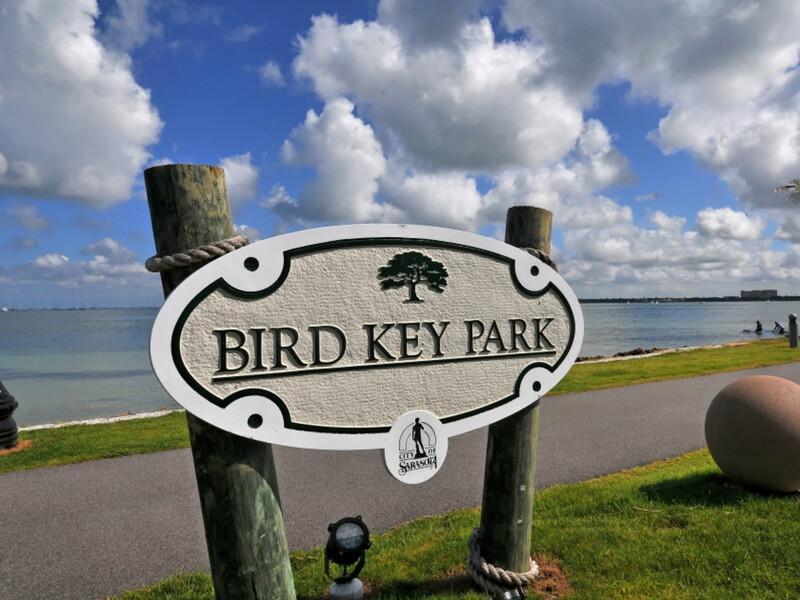 Bird Key Park faces the calm waters of the Sarasota Bay, making it a great location to just paddle around. There are several key paddle destinations within a 15 minute paddle. See the small towns of Bird Key and Otter Key from the water and wave to people having drinks and something to eat at Marina Jacks. Keep your eyes peeled for marine life as you’re paddling around. Locals call the channel just off Bird Key “Dolphin Highway.” It’s no secret that dolphins cruise the channel all going back and forth between the Gulf and Bay. A three-mile strip of white sandy beach in Sarasota makes up Lido Key. The beach at the southern end of Lido Beach can get fairly crowded, so head to North Lido Beach for pristine beaches and great paddling without the crowds. Set up your base camp for the day after you park in the free parking lot just down the street from St. Armand’s Circle and go for a paddle. The waters are generally calm, but the sandbar is where more advanced paddlers will want to go. 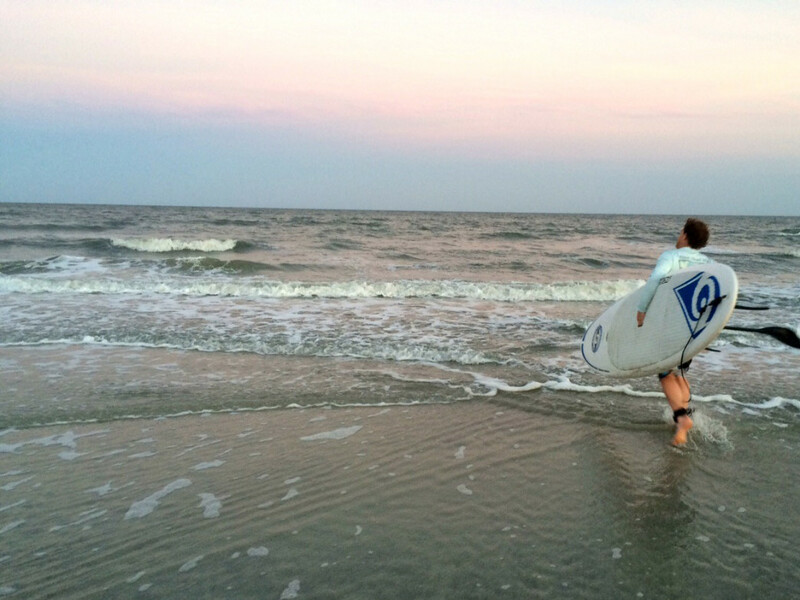 Out at the sandbar is where all the waves break. This is this place to go when you want to catch some waves. The incoming energy of the ocean hits the shallow sandbar and forces the water on the surface to stack up and crash, making great waves. Paddle right back out to the lineup after you catch a wave. While you’re paddling out, look down at the crystal clear water every so often. The ocean’s teeming with life right underneath your feet. You don’t want to miss a chance at seeing little fish, sea rays, crabs, and dolphins. You might even get to share a wave with a dolphin if you’re lucky. That’ll never happen unless you get out there and give it a shot. The south end of Lido Beach is where you want to go for sights unseen. 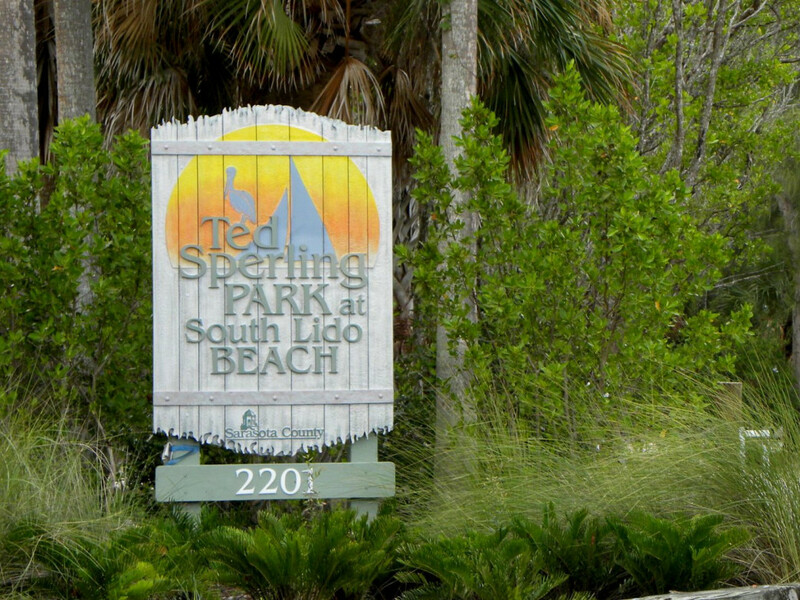 To be more specific, go to Ted Sperling Park. The park’s free to everyone and has a picnic area, nature trail, a SUP/canoe/kayak launch, and a self-guided SUP/canoe/kayak trail. That’s right, a trail on the water. What makes this water trail so great is that you paddle through mangrove tunnels. Most places you can paddle through mangrove channels, but here you’re paddling through the shade of the mangroves where in spots you might even have to duck to get through some tight spaces. For those that have never seen or learned about mangroves, they house an abundance of wildlife. While you’re paddling through the mangrove tunnels, you can expect to see an array of bird species like osprey, heron, egret, pelican, and more. 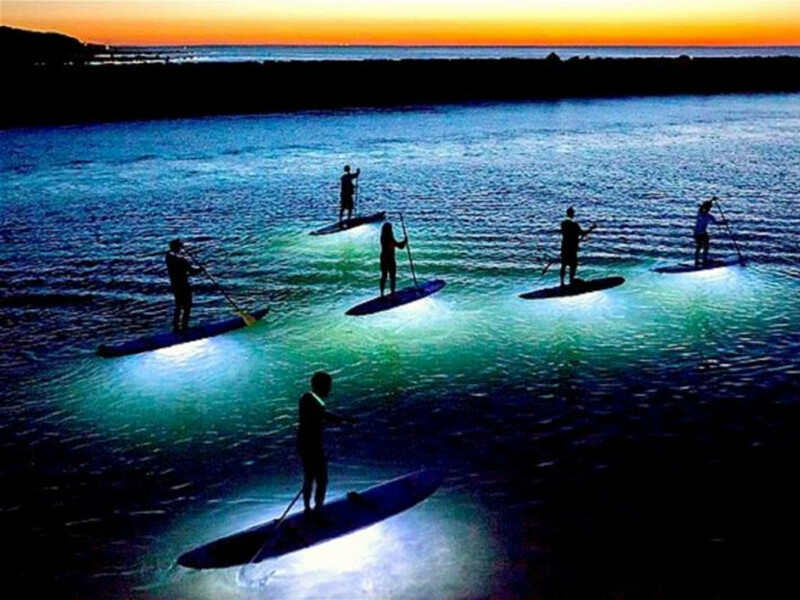 Come late in the day and stay into the night for an illuminated paddle endeavor through the mangroves. All you need is some LED lights on the bottom of your board and a headlamp to completely change the way you see the mangroves. As the lights illuminate the water, look down and see the fish swimming towards the light and an abundance of living shells like clams, scallops, and conchs right beneath you. 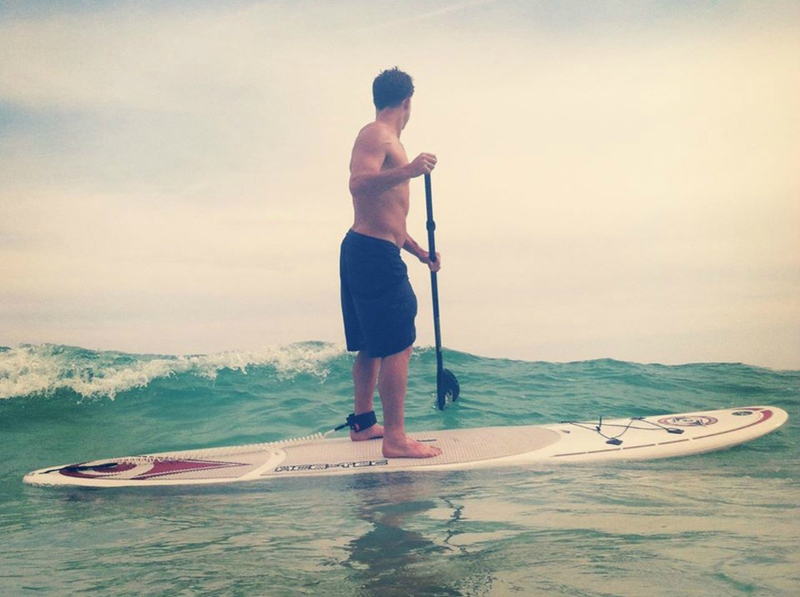 There are an array of locations and paddle boarding destinations in Sarasota, FL. These are just a few of our favorite spots. Make sure you stop in to see the friendly folks at these local shops to get all the info and equipment you need before heading out. Dolphin Paddlesports offers a wide variety of SUP gear and a knowledgeable staff to help answer any questions. They have rentals as well as demo days so you can try your board out before you buy it. Rent or purchase a paddle board here. If you’re new to the sport, check out their lessons and tours to gain a better understanding of the sport and area you are paddling around.